Below are the steps to setting up High School V Planner. I might elaborate on some items or I might link to a page that has more information. When you open the planner for the first time, you should be at a worksheet called About. About displays some general information and if you scroll down, some tips how not to break the planner. Please read about how not to break the planner because the High School planner is a 4-year planner and you should be very interested in not breaking it during those 4 years. At the top of the About worksheet are some links and information about two important items in the High School V Planner. I will briefly go over those two things here. FIRST- The Category List – What are categories? It is important for you to know that the first grade scale, GS 1, is the default grade scale. It is default because it is the grade scale that is selected throughout the V Planner. I suggest that you visit the worksheet GS-QP and edit the first grade scale so that it matches your grade scale and then return to the About worksheet. How to edit the grade scales is written on the GS-QP worksheet and you can also read about editing the grade scale here – http://donnayoung.org/homeschool-vplanner/set-up/gs-qp. The link that you should click on after checking the Course Category List and the Grade Scales is Data. If you have already opened the planner and looked around and you have sort of lost the About worksheet, don’t worry, go to the first worksheet that it in the planner. It is called Today. The Today worksheet has a link to every important-to-you worksheet that is in the planner. I. Here you will enter the First Name of the one student who is using the planner. IV. The student’s school grade is already entered. Do Not Change It! At this table enter the places where your child will take a class or two or more. The list supports 8 different places and this is for all 4 years; please keep that in mind. Once a location is set and has been selected at a Data# worksheet, then do not remove the location at any point the planner is in use. The only reason that a location should be removed is – You don’t want the place to become a record on the transcript. B. Choose a character number which will become the key on the transcripts. Note: If the keys are unsatisfactory, they may be edited at the Lists worksheet and if editing is necessary; Edit the Keys First, before selecting the Character Number. Credits earned before high school – There are 12 places for this. To fill, enter the information as noted by the headings on the table. If the items in the table confuse you, then come back to this later. After using the V Planner for a while, you will know what all of this stuff is. A table of where to go next. Chances are you will have to go to one of more of these worksheets next- Data1, Data2, Data3, Data4. Pick one and go there. If the student has already completed any of the grades 9th, 10th, 11th, and 12th, you may still go to those certain data# sheets and set up classes so that the classes will appear on the 4-year transcript. Next you will fill in the numbered Data worksheets for each school year or just for the current school year. I will give instructions for Data1. Instructions for Data1, Data2, Data3, Data4 are the same. Enter the date of the first day of school. Select how many grading terms this student will have. The choices are 2, 3, 4, 5, 6. If using credits, enter the credit; if not using credits, leave blank. Select the course category – this is optional, but I strongly recommend that you do this. Where was this class taken? If Using, select the class location from the drop-down list. Before we leave the classes that are for S-Sheets 1-10, PLEASE make sure that each short class name is not like the others. I added an error notice that should tell you if any class names are alike. Choose the school term for each class – The choices are Full Year, 1st Semester, 2nd Semester – this is important for placing the grades on the reports. Column A- Select Main1, Main2, Main3, OR leave this blank. Column B – Select the class name. In column H enter the book, and optionally the author- one per row. It’s best to not skip rows. THE BOOKS FOR OTHER COURSES – Fill this in, or skip this for now At around row 150 are several tables reserved for the classes for “Other Courses”. The tables are marked so that you will know which table is for which calls. To fill then, enter the book/material title. That is all for Data# Worksheets. I have provided a table on each Data# worksheet that will tell you which Data# worksheets should be set up or checked. Also, be sure that the current Data# worksheet is error free – the worksheet will “tell” you if you need to fix mistakes. You do not have to set up the data worksheets for the remaining future high school years, but the completed high school years, if any, should be set up. Do not go to the next step until the Data# worksheet is filled at least through number 12 in the list above. Thank you. Next the “school calendar” must be established. Each high school year has a calendar. Days worksheet is a long worksheet that is full of dates. Each year has a section and it should be clearly marked. In the column under the word Total, type an x (lowercase or uppercase) next to each planned school date. Tip- “x” ALL of the planned school dates for the entire school year – this makes setting up the rest of the planner go more smoothly. You do not have to set up future years at this time. Here you will set the beginning dates for each grading term. The number of grading terms were set at the Data# worksheets for each student. At the Terms worksheet, the selected term numbers will appear next to a white cell. Do this for each year that you are setting up. Note: If you did not set up all four the calendars at Days, then you cannot set up all four groups of term dates. EITHER set up lesson plans OR set up the term grade calculators. Either one can be done first. IF you know how you want to sort/label/weigh the grades for each class, then go ahead and set up the term grade calculators. First I will walk you through the setup for a Term Grade Calculator. Instructions for all of them are the same. Now that you know WHICH calculators to set up. Here is how to do it. Decide if this class will have different values (weights) for the student’s work. The calculators support up to four different values. If I’ve lost some of you with this comment, please visit this page because it goes over grade calculators in detail- http://donnayoung.org/homeschool-vplanner/s-sheets/term-grade-calculators. In the row that is next to the word Term – enter the values. The values are percentages and when all are added, they must equal 100%. Don’t worry, the calculator will stop telling you the value is wrong once they are right. Type a Word – Under each value you may type a word that describes the part of the class that the value is for. That sounded confusing so I will give an example. Let’s say that you have three values – 20%, 30%, and 50%. You must have had some reason for that – let us say the 20% is for graded daily work. SO under 20%, you could type Work or Daily, but not both. If 30% is for quizzes, then under 30%, type Quiz. If 50% is for tests, then under 50% type Test. On the split s-sheets (7-10), you will have to scroll down to see the calculators that are used for the 2nd semester. That is all there is to setting up a Term Grade Calculator. While there is some thought that goes into how a class is graded, the graders are easy to set up. Before adding lesson plans KNOW and Understand the following – Each lesson plan ROW = ONE DAY . The row includes the date, the plans, and the scores and the items in the row stick together like glue. Well except for the date – the date can be “bumped”. What this means is the items shown in the image below STICK TOGETHER, NO MATTER WHAT. The sticky items are – Column 1, Column 2, Column 3, the scores, the points, and the time. These items cannot be separated unless you physically remove them. (DO NOT drag or cut items in the V planner.) Knowing what sticks together should help you “sequence” parts of the class. What I am trying to say is this – It is important to know that the items in Columns 2 and 3 cannot be separated from Column 1 when bumping dates (DS) or numbering plans (NS). Keep that in mind when using the 2 extra columns. One last thing to consider is that the 3rd lesson plan column “Column 3” may be used for something special such as teacher’s notes. Lesson planner AUC3 will display only the items from Column 3. Adding Lesson Plans– The basic way to enter lesson plans is to enter each lesson plan one at a time row after row. 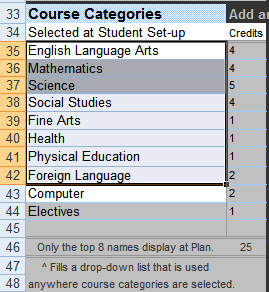 When entering lesson plans, ignore the dates in yellow column because those can be changed with Bump. There are other ways to enter lesson plans, such as pasting the plans from a file, but there are things to know about that before attempting it. View GS 1 and ask yourself – Is this like my grade scale? If it is GREAT, you are done, but if it isn’t you will have to alter it to match your grade scale. IMPORTANT – once the grade scales are established and in use, don’t go back to GS-QP to change them unless you need to fix a mistake. The 3 grade scales must be used for all four years of high school — This is very important to know, don’t be nit-picking the grade scales, YOU ONLY HAVE THREE for all 4 years of high school! Column R – Make sure the QP scale is correct – this is important only if the class is earning credit. Default is GPA, which represents the standard 4.0 scale. That should cover everything for setting up the High School V Planner. Write me to let me know if I missed something.